Zack de la Rocha, Brad Wilk, Tom Morello. 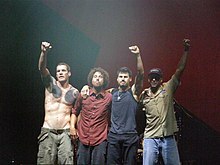 Rage Against the Machine (an aa kent as RATM or simply Rage) is an American rock baund frae Los Angeles, Californie. This page wis last eeditit on 25 Apryle 2018, at 20:38.